Dr. Robert White presenting winning research. Department of Anesthesiology resident Dr. Robert White was honored on April 23 with an inaugural Dean’s Diversity and Healthcare Disparity Research Award. The awards provide a year of research funding to investigators whose work seeks to improve the health of underrepresented minorities and achieve health equity for people locally and globally. 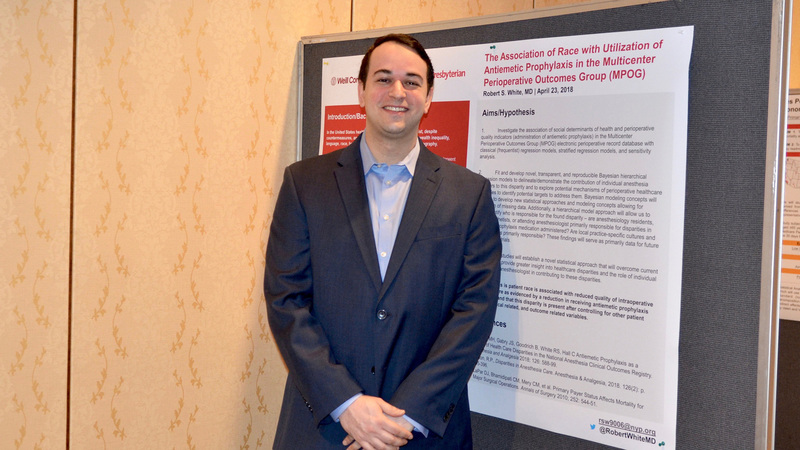 Dr. White was recognized for his research titled "The Association of Race with Utilization of Antiemetic Prophylaxis in the Multicenter Perioperative Outcomes Group (MPOG)," which looked at disparities in anesthesia care among patients with lower socioeconomic status. Co-authors of the study are Dr. Zachary Turnbull, Dr. Kane Pryor, Dr. Michael Andreae, Virginia Tangel, Noelle Arroyo and Anna Nachamie. Dr. White, a member of the Residency Class of 2018, is a Van Poznak Research Scholar in the Department of Anesthesiology. Weill Cornell Medicine faculty members pictured with Dr. Augustine M.K. Choi. Dr. White is fourth from right.